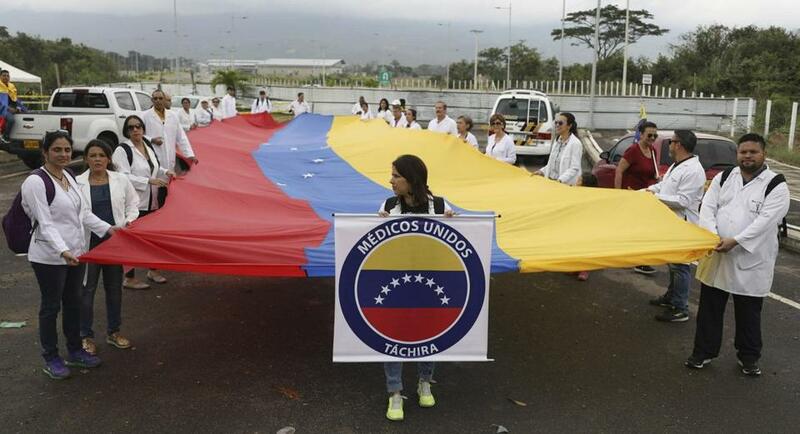 Venezuelan doctors held a giant Venezuelan flag as they protested the government of President Nicolas Maduro at the International Bridge Tienditas, which has been blocked by the country’s military, near Cucuta, Colombia, on Sunday, across the border from Tachira, Venezuela. The doctors, who crossed into Colombia for the protest, are demanding their nation’s military allow humanitarian aid into the country. CUCUTA, Colombia — Venezuelan doctors protested Sunday at the entrance to a bridge blocked by their nation’s military to demand that humanitarian aid be allowed to enter, as opposition leader Juan Guaido acknowledged the conflict over the food and medical supplies could lead to clashes. Guaido, the leader of the National Assembly who four dozen nations are recognizing as Venezuela’s rightful president, urged the military to think carefully about how they will proceed. Attending a church service Sunday with his family, he recognized that the feud between those who do and do not want the aid to be let in could lead to clashes. President Nicolas Maduro has vowed not to let the supplies pass, saying Venezuela isn’t a nation of beggars. He contends the food, hygiene kits, and emergency medical gear are part of a larger ploy by the United States to remove him from power. The United States provided the aid and the Colombian government helped ensure its transport to the border, but the opposition is charged with handling the aid’s distribution within Venezuela. They have not yet announced how they plan for the aid to enter if the military does not consent. Guaido declared himself Venezuela’s interim president before masses of cheering supporters in late January, arguing that under the constitution he should become chief of state because Maduro’s reelection was a sham.